ATREG is very pleased to announce that the sale of Texas Instrument’s 150 / 200mm fab (GFAB) located in Greenock, Scotland, UK is in progress. The facility’s buyer, Diodes Incorporated, plans to integrate the facility and fab operations into its fold, including retaining all Scottish GFAB employees. Click here for more details about this announcement. 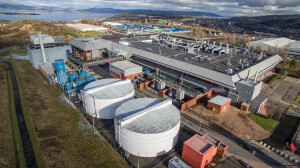 Texas Instruments (TI) has retained ATREG to facilitate the sale of its operational 200mm / 150mm fab located at Earnhill Road, Larkfield Industrial Estate in Greenock, Scotland. The facility may include a multi-year supply agreement, allowing the buyer to generate revenue during product qualification and production ramp. TI’s Greenock engineering team has extensive process conversion experience, including product migration from 150mm to 200mm. The 23-acre site includes surplus land that could be utilized for future expansion. The fab is automotive qualified and represents a particularly attractive acquisition opportunity for companies producing performance-critical power components and complete power systems used in the automotive market. For technical questions about the facility, please email Stephen Rothrock or call +1.206.268.7808 or download our fab offering brochure.